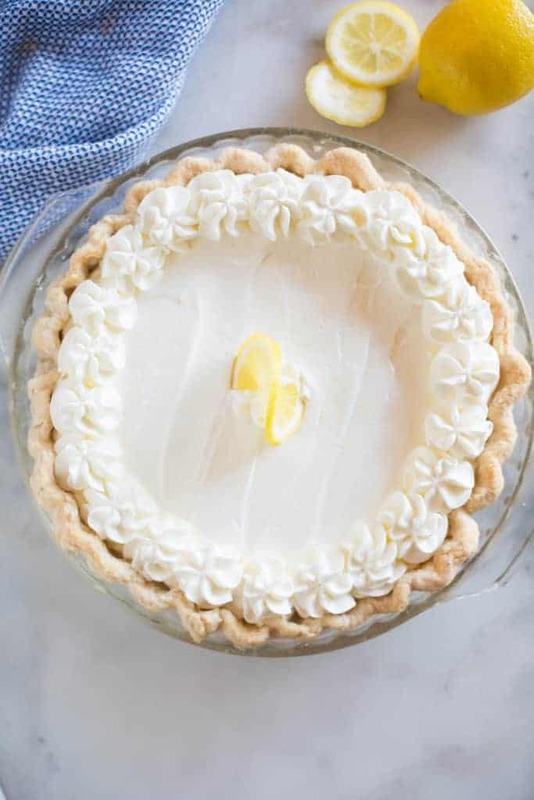 Creamy, dreamy Lemon Sour Cream Pie could be my favorite pie recipe of all time! I’ve mentioned before that my beautiful sister-in-law, Jessica, blogs over at Pretty Providence. 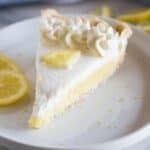 Several years ago I noticed that she posted “The Best lemon sour cream pie ever!” and when I saw it, I was totally intrigued. You see, she is married to my brother, Bryce, who is the biggest pie snob on the planet. And he’s especially particular about lemon pie–his favorite! So if Jessica posted a lemon pie recipe that claimed to be “the best ever”, it meant it had Bryce’s stamp of approval, and it really must be the best! So, I made the pie that Friday night. And I made it again on Saturday night. I’ve made it dozens of times since, and I completely agree that it’s the Best Lemon Sour Cream Pie recipe! It has the perfect level of lemon tartness combined with the perfect level of creaminess. And, I love how easy it is to make! 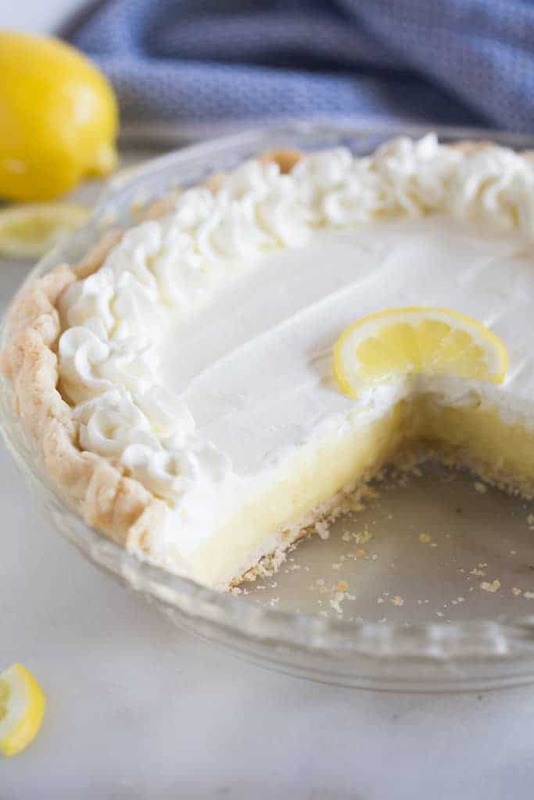 The process for making this lemon sour cream pie is really simple. Here are some step-by-step photos to walk you through it, and I’ve also included a video, below. Start by adding sugar, cornstarch, lemon juice and milk to a saucepan. Stir everything together until smooth. Add the egg yolks to a bowl and whisk them together. Heat the mixture in the saucepan. Stir it often, until it begins to thicken and bubble. Reduce heat to low and cook it for two more minutes. At this point it’s time to add the eggs, but we need to temper them first, with the hot liquid. If you add the beaten egg yolks right away then you’ll end up with scrambled eggs in the pudding. To temper the eggs, add a spoonful of the hot mixture from the saucepan, into the bowl with the eggs. Whisk it well. Add another few spoonfuls, whisking the mixture after each addition, until the egg yolks are pale yellow. Then, add the egg yolk mixture to the saucepan. Stir everything until smooth, and continue to cook the mixture until it comes to a low boil. Cook it got two more minutes, then remove it from heat. Add butter and lemon zest and stir until smooth. Allow the pudding to cool for at least 15-20 minutes, and then stir in the sour cream. Pour the pudding into a blind-baked (already cooked) pie shell. At this point you can refrigerate the pie for 2-3 hours, and then top with fresh whipped cream, or make the whipped cream and top it immediatly, and then refrigerate for a few hours. Make sure to let the pie refrigerate for a few hours to give it time to set up, before you cut it. The last thing we want is the pudding mixture to pool into the center of the pie when you remove your first slice! Combine flour and salt in a medium size bowl. 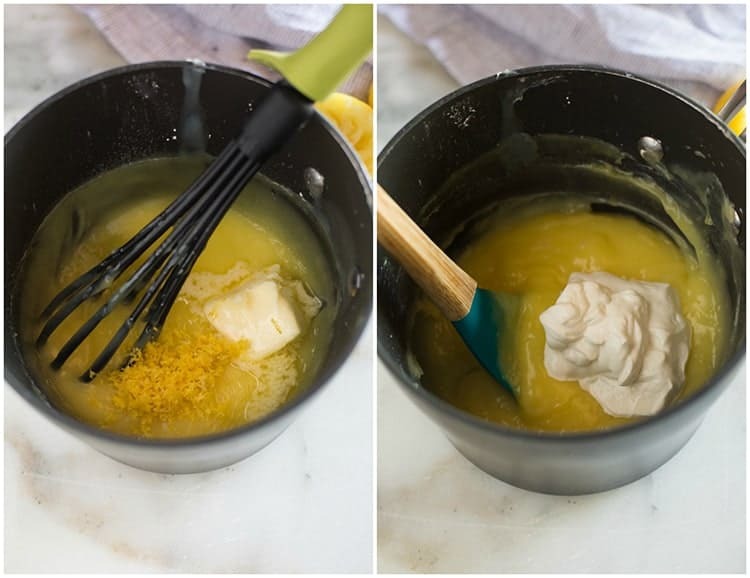 Add the shortening and chunks of butter and use a pastry blender to cut in the butter and shortening until the mixture resembles coarse crumbs. Add ice water to the mixture a tablespoon at a time until the dough begins to clump together. Form into two balls and chill the dough for about 2 hours. Use my parchment paper and towl trick to help making rolling our pie crust extra easy! Find the full recipe here. This lemon sour cream pie is absolutely fantastic and beloved by our family. I hope you all enjoy it just as much! Crack eggs in a small bowl, beat slightly with a fork and set aside. In a large saucepan combine sugar and cornstarch. 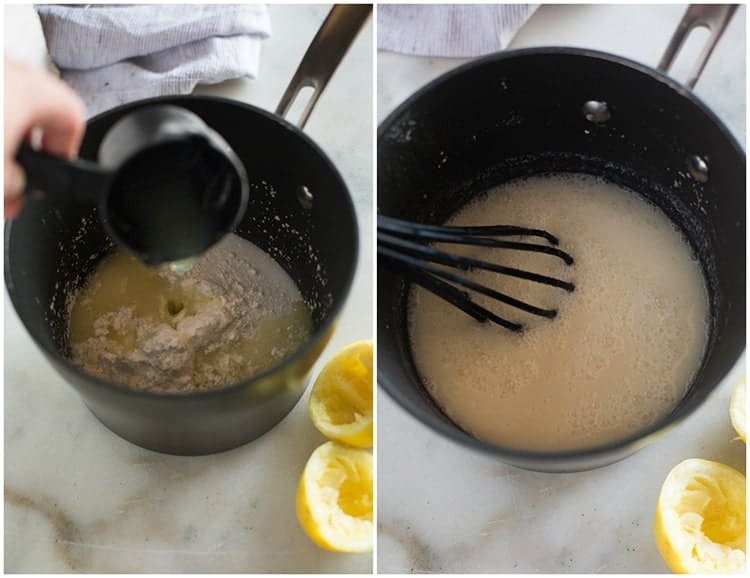 Whisk in milk and fresh lemon juice and stir to combine. Cook over medium heat, stirring constantly, until mixture is thick and bubbling. Reduce heat to low and cook for two more minutes. Add a spoonful of the hot mixture into the egg yolks and stir well. 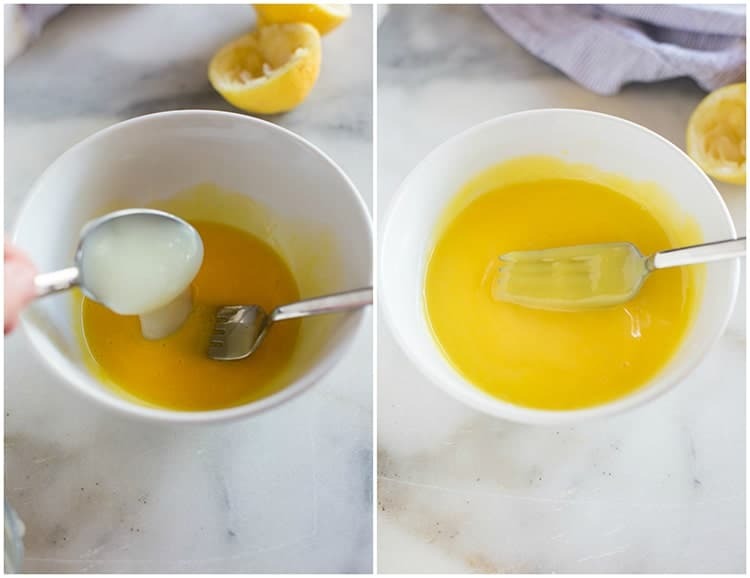 Repeat this process with two or three more spoonfuls of the hot mixture added to the egg yolks. (The goal is to temper the egg yolks so they don't cook when added to the hot saucepan.) Poor egg mixture into the saucepan and stir well. Bring mixture to a gentle boil and cook for two more minutes. Remove from heat. Add softened butter and lemon zest and stir until butter melts completely. Allow mixture to cool and then stir in sour cream. Add filling to your pie shell. In a mixing bowl, beat heavy whipping cream with an electric mixer. While beating, add sugar. Continue beating until stiff peaks form. Spread whipped cream over pie filling. Refrigerate for at least 2-3 hours before serving. Enjoy the best lemon sour cream pie ever! 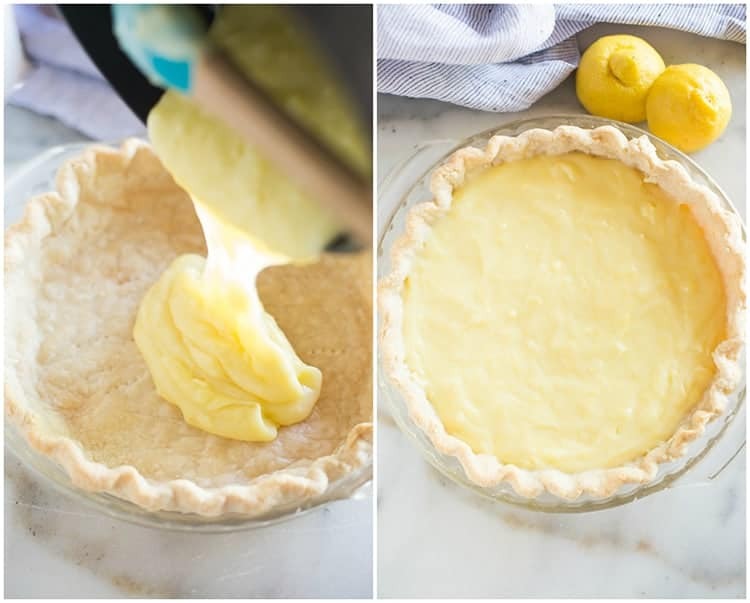 Don't miss my tips for perfect lemon sour cream pie listed in the post above! Hi Ariane, I haven’t tried it, so I can’t say for sure. But, I’m not sure that I personally would, just because I think freezing it would really change the texture and dull the taste. I have made this pie several times and love it! It has now become a holiday favorite. I have also used key lime instead of lemon. It was great as well, although a very different flavor yet that was to be expected. This recipe is requested at every BBQ I attend and my mom requests it every birthday! We all love it…thank you! Wonderful! Thank you for sharing!! Amazing pie and your crust recipe is the best ever! This pie is heavenly! Lemon is my favorite flavor and I crave it year round. This pie was the perfect blend of lemon flavor with creaminess that held it’s shape and have wonderful texture. This is one pie I will be making over and over again! Made it for thanksgiving and it was so yummy and creamy! We will make it again for sure! Can you use graham cracker crust? Sure, that would be delicious! Never heard of Lemon Sour Cream pie prior to this recipe. Super easy to make and BEYOND DELICIOUS!!! New pie added into my rotation. 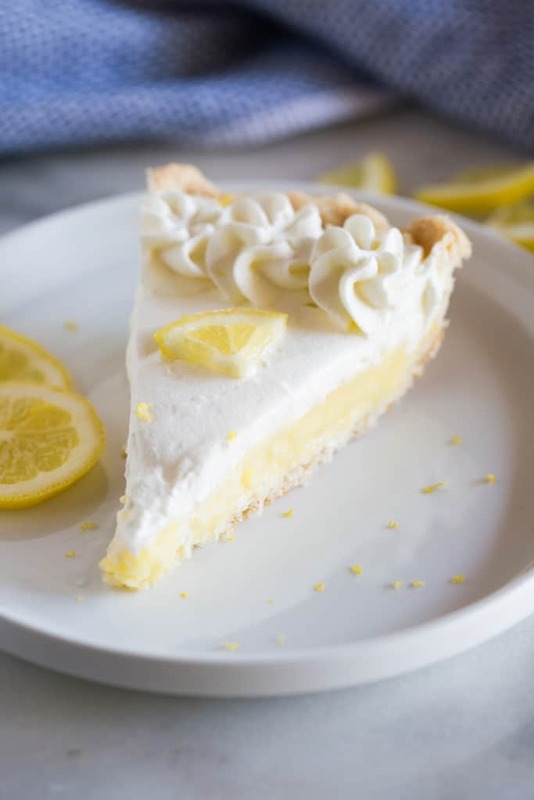 Delicious lemon pie. I do not care for regular lemon pie, but this one is amazing! We can’t get enough of it. This is the 2nd time in 3 days I’ve “had” to make it. The only thing I added was a little lemon extract for an extra kick of tartness. I made this twice in one week and it was enjoyed both times. I’m keeping this recipe!